The Officer - Death's Finest Ally: Few have seen him. Even fewer have lived to tell about it. Fear is his friend, and Death is his ally. The Harlequin - The Walking Nightmare: Behind the gaudy costume and twisted smile lies the soul of a merciless Assassin. Helmschmied Drachen Armor: Fashioned by the Helmschmied Armory in 1489, only a few sets were completed due to the weight of the metal. Very few men proved strong enough to wear it. MASTER THE POSSIBILITIES : As Ezio, a legendary Master Assassin, experience over 15 hours of single-player gameplay set in the living, breathing, unpredictable city of Rome. 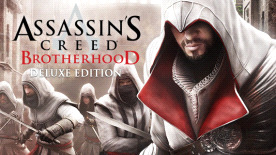 LEAD A LEGENDARY BROTHERHOOD : Recruit and train promising young Assassins. Deploy them across the city as you see fit, or call upon them to aid you in your quests. EXPERIENCE A RICH HISTORICAL TAPESTRY : Collaborate with real historical characters such as Leonardo da Vinci, Niccolo Machiavelli and Caterina Sforza. WIN THE HEART OF A CITY : Use your hard-won currency to revitalize the crumbling capital city. Rally the citizens to your cause and unlock extra factions and missions. DEPLOY SECRET WEAPONS : Swiftly eliminate your enemies using tools such as poison darts, parachutes, double hidden blades, hidden guns, and an advanced flying machine at your disposal. MEMORABLE MULTIPLAYER : Choose from multiple authentic character classes, each with their own signature weapons and killing moves. With richly-detailed maps and a wide variety of unique multiplayer modes, you’ll never fight the same way twice.